Last week, I helped to throw a little surprise baby shower lunch for my boss. She's due with her second baby boy in a month, and we wanted to do a little something for her at work. I took inspiration for my card from one that Kristina Werner had posted awhile back, which you can check out here. Of course, she's a pro, and hers is way cuter! My boss has a nautical themed nursery, so I loved the idea of a mom and baby whale. I didn't have any mom and baby whale stamps though, so I purchased this digital stamp from 2CuteInk's shop on Etsy. I used PSE to slightly modify the image so that the baby had a different face than the mom. Then I printed them and colored them in with Copic and Spectrum Noir markers. For the shaker window, I die cut a square frame using the Lawn Fawn Stitched Squares dies. 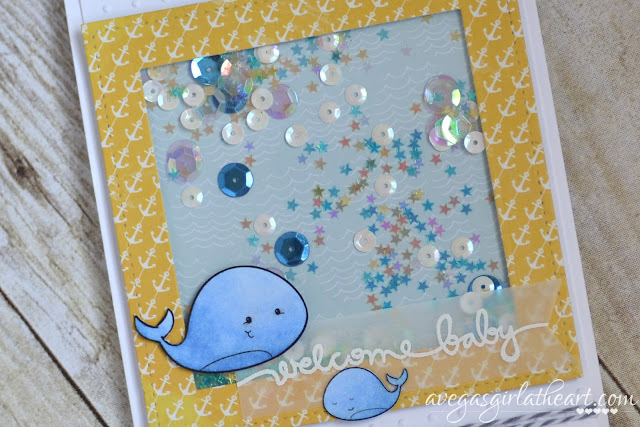 The papers are from the Glitz Uncharted Waters 6x6 pad and the Studio Calico Atlantic 6x6 pad. I added in a bunch of random sequins and used some spare transparency film I have on hand, and put my shaker window together using foam tape. 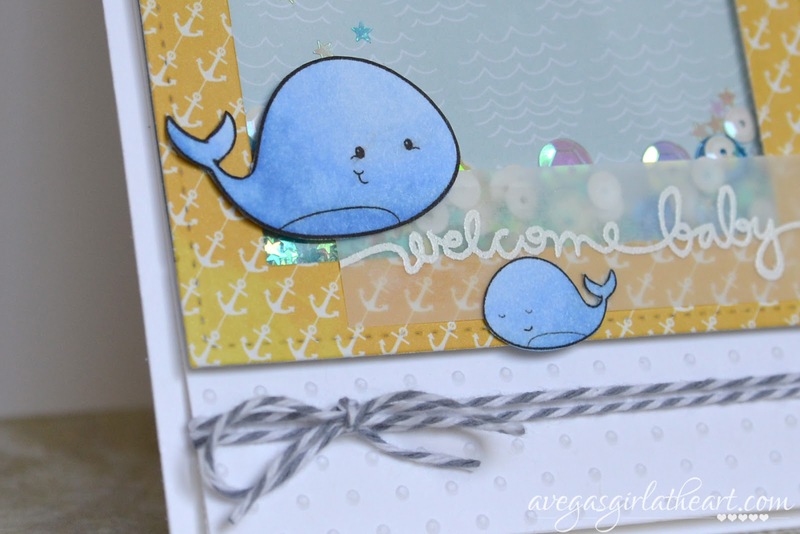 My sentiment was stamped onto vellum from the Simon Says Stamp Handwritten Borders stamp set and embossed with Stampin' Up! white embossing powder. 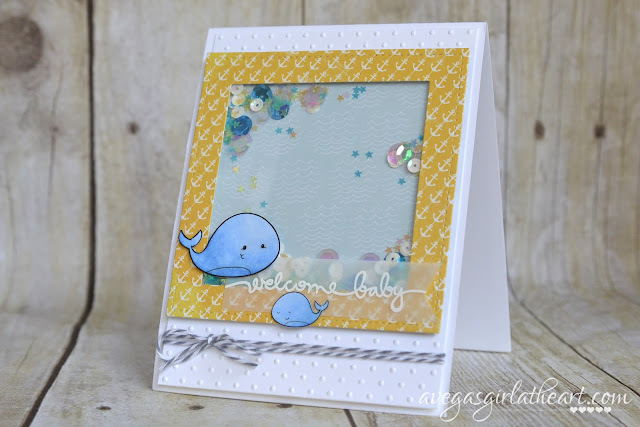 I embossed the dotted panel using the Cuttlebug Swiss Dots embossing folder, added some gray baker's twine tied in a bow, and the card was complete. I do love how it turned out and my coworkers and boss thought it was adorable, so, yay, success!